Palazzo Della Luna’s residences are appointed with a list of inspired details that are not only beautiful, but also offer the highest quality functionality from a well-edited selection of the world’s leading luxury brands. All materials, surfaces and fixtures have all been hand-selected to achieve a supreme level of comfort and luxury. 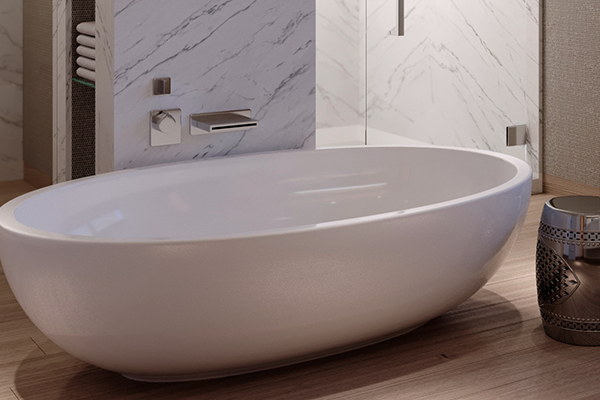 The luxurious “Fisher Island” bathtub, inspired by its namesake, illustrates the prestige of the unique design partnership with Boffi. 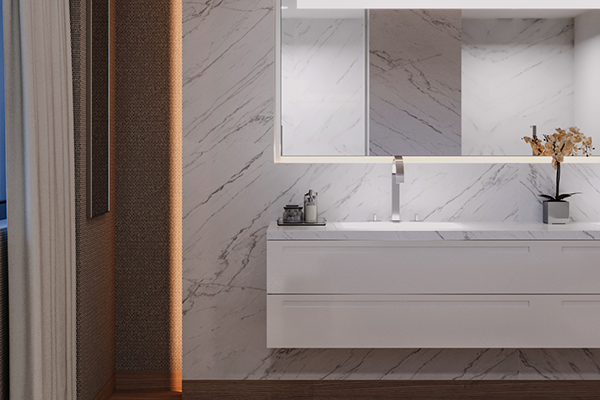 In addition to the residences at Palazzo Della Luna, the tub is now available at Boffi’s flagship location, across Europe, the Americas, and the Far East. The Secondary Bathrooms are equipped with Velvet Statuario. 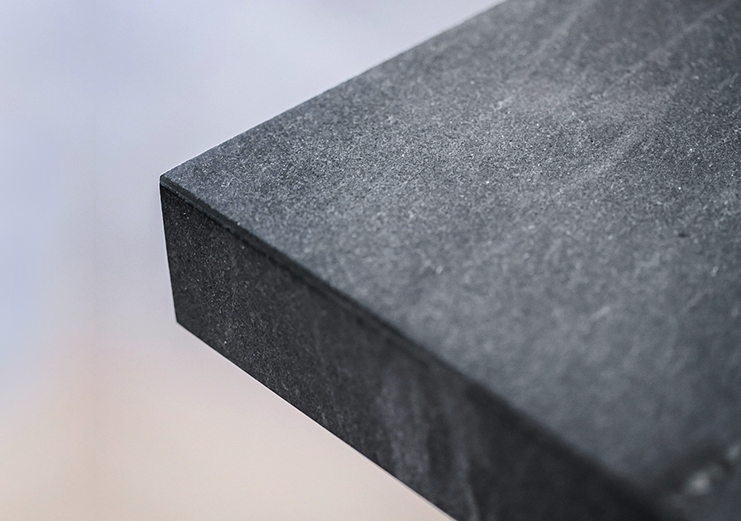 Palazzo Della Luna is interpreting marble in architecture in a visionary new way. Each residence has its own distinct personality. Every Margraf marble panel is prepared according to the ancient Italian technique of “open book”, known to the Romans since at least a half century. The “bookmatched” marble and natural stones are by definition impossible to reproduce, and like works of art they are open to individual objective artistic interpretation. 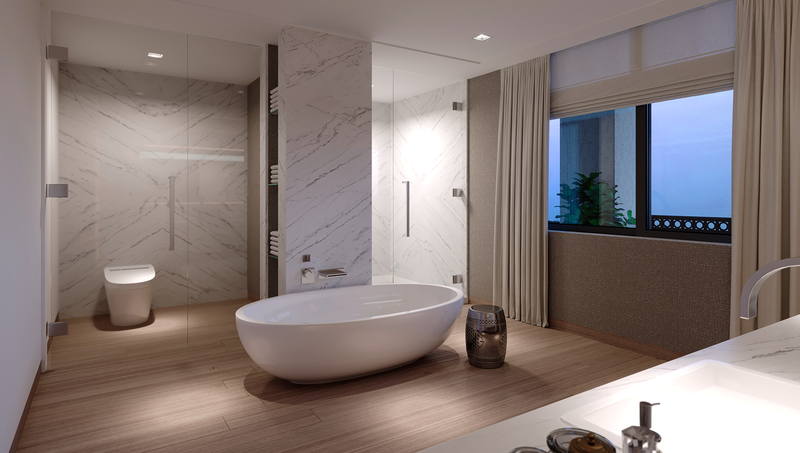 Homeowners will delight in the honed finish marble found in all residence bathrooms at Palazzo Della Luna. Duravit SensoWash® represents a new feel for design, comfort and cleanliness. 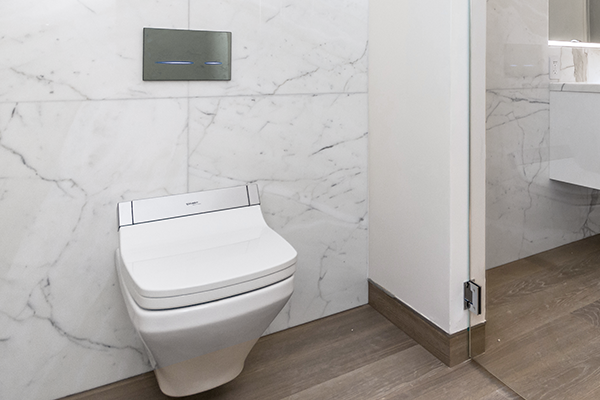 The intelligent shower-toilet offers great quality of life and its various functions – from opening the toilet lid to selecting the cleaning nozzles – can be easily operated by remote control. 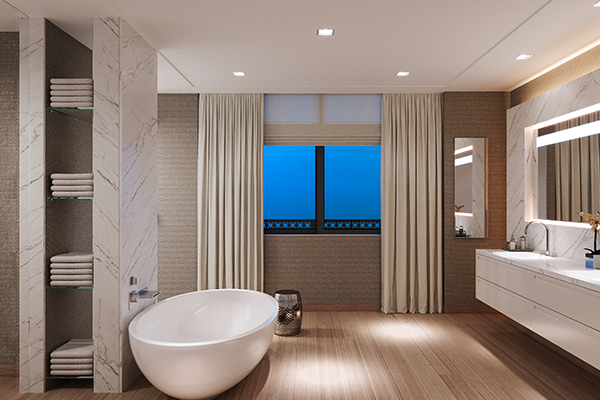 Dornbracht plumbing controls at Palazzo Della Luna are the embodiment of exclusive design. 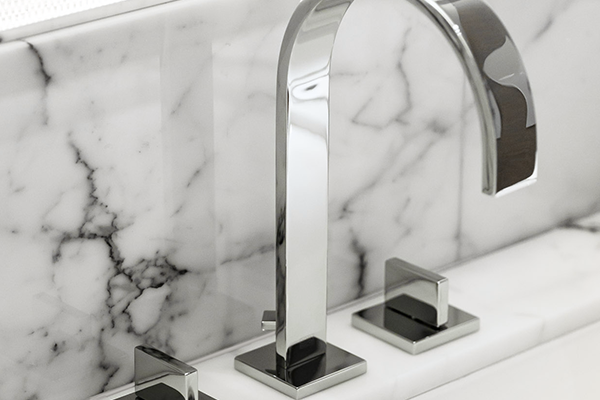 Dornbracht is distinguished by its German heritage, and the company’s sophisticated designs have won numerous international awards. The brand is renowned worldwide for being an innovative leader of vibrant creativity and luxury innovation. 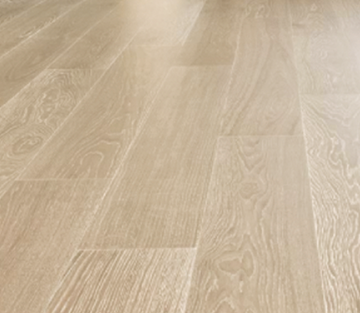 The residences at Palazzo Della Luna are delivered with sumptuous wide plank European oak wood flooring throughout the interiors and deep terraces come complete with wood-look porcelain tile flooring. Crafted with exceptional materials, the flooring enhances the spacious floor-through layout of each unit and allows for owners to move in quickly and easily. 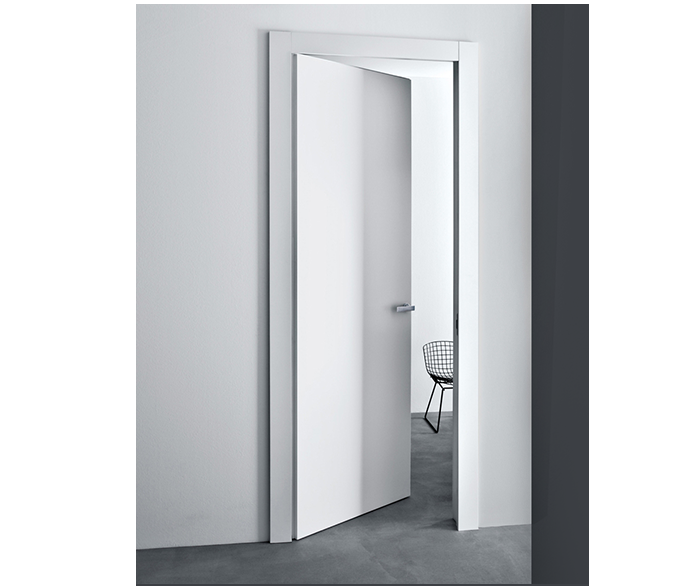 Lualdi has earned recognition for its leadership in the design of interior doors and custom furniture through intense research and development overtime experimenting with new forms, technologies, processes and materials. A pioneer in industrial design since 1960, Lualdi has developed a range of high quality products curated by the top names in Italian and international design including models which are featured throughout the residences and common areas of Palazzo Della Luna. 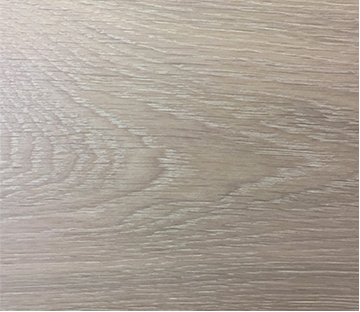 For four generations, Lualdi has paid meticulous attention to product quality and processes, while at the same time upholding a time-honored commitment to the protection of the environmental, social and ecological sustainability of all materials and resources used. Customized refrigerators from Sub-Zero, a pioneer in integrated refrigeration, blend seamlessly into the kitchens at Palazzo Della Luna. 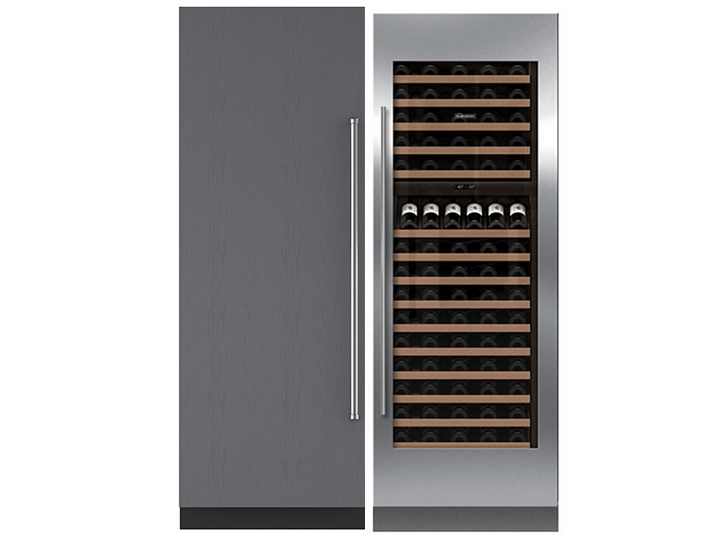 And Sub-Zero wine preservation units act not merely as coolers but as guardians against heat, humidity, vibration and light – the four enemies that can rob wine of its complexity and character. Better storage for the bottle means more enjoyment in the glass. Following the successful collaboration with Palazzo Del Sol, Boffi is honored to partner with Palazzo Della Luna and again bring consistency of quality, design and passion the brand is known for to the kitchens and master bathrooms at Fisher Island’s most prestigious building. Boffi’s 360-degree design view is harmoniously integrated with Champalimaud’s total design concept perfectly suited to the beauty of the island and the prestige of the project. Modern kitchens featuring Boffi’s Xila Collection cabinetry with Blum self-closing hardware are delivered durable and stylish Bohemian grey granite countertops. 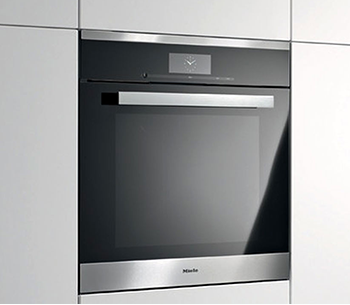 Palazzo Della Luna’s residences boast gourmet kitchens at the vanguard of design thanks to a selection of Miele appliances that everyone from the novice home cook to an accomplished chef will love. 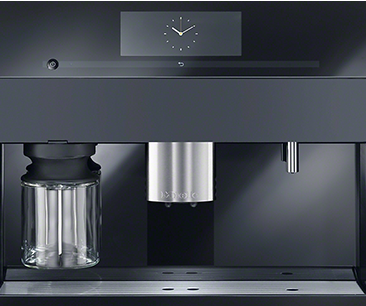 Miele products set the standard for durability, performance, ease of use, energy efficiency, design and service.